Following our briefing on AFL Memes and our e-mail to Facebook, the two worst examples from the page were removed on June 3rd. Ten day’s later the page itself was closed. 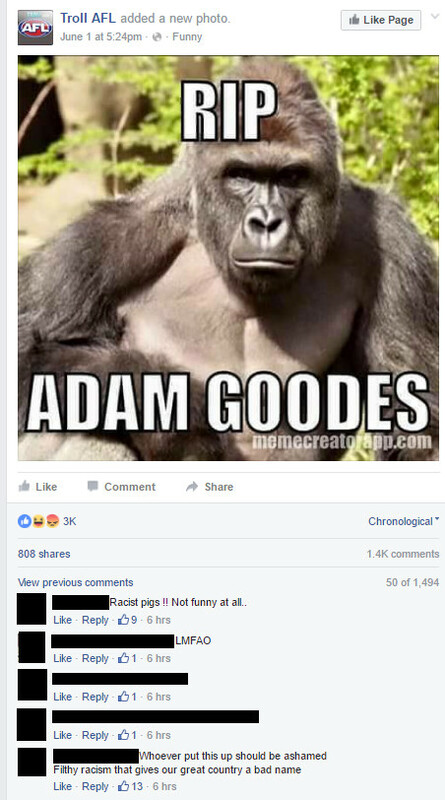 The same people, however, have another AFL Memes page with another Adam Goodes meme is still online. You would think that losing almost 200,000 supporters when the main page was closed would be a deterrent. You would hope this action would see them both cleaning up their second page and being more careful about posts which promote hate speech in the future. Instead, there response claims “we got some reports for no reason!” and that the page “is obvious humour and not intended as a ‘hate’ page”. As fans of the page pointed out, “just because you call it a joke doesn’t mean its not racism”. We are against encouraged by those who spoke up, but disappointed the admins of this page still don’t get it. Humour, satire and social commentary may be permitted, but when they cross into racism they cross the line. 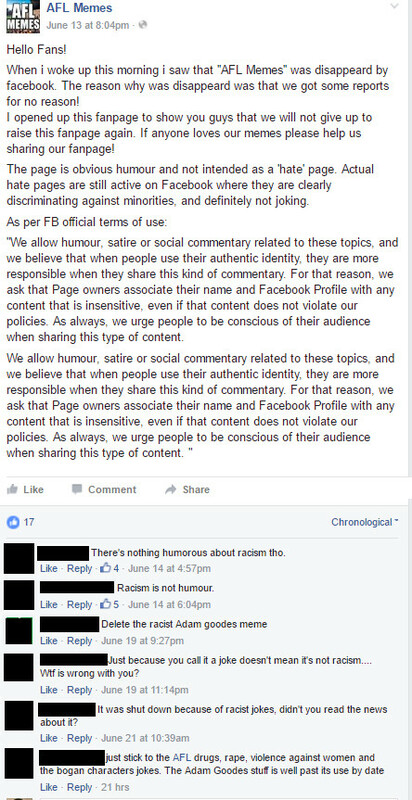 Saying it was only intended as joke doesn’t make racism or any other form of hate speech suddenly ok. Speaking of racism which is still online, a similar racist meme targeting the NRL has also not yet been removed. It isn’t enough for the examples which are all over the media to be removed. We need all hate to be removed regardless of how much attention the media gives it, or who is targeted. A safe online environment free from hate speech is something for everyone, not just celebrities, politician or those whose stories make the papers. The fact these two memes are still online shows there is still alone way to go before Facebook’s reporting system can be trusted to get it right. Until that happens the Online Hate Prevention Institute, with your help, will continue to monitor and report on these incidents of online hate and social media abuse as long as we have the funding to do so. 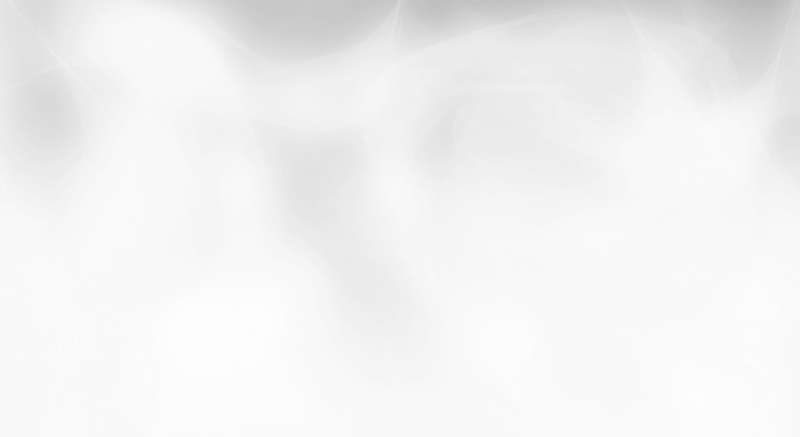 The Online Hate Prevention Institute is a charity registered with the Australian Charities and Not-For-Profit Commission and endorsed by the Australian Federal Government as a Harm Prevention Charity. Donations are tax deductible and enable us to continue this important work. Please chip in so the work can continue. We welcome your shares, likes and comments, but they won’t help us pay for our rent, insurance, auditing, technology costs or other expenses. You can also get involved by joining the Online Hate Prevention Institute on Facebook (visit our page and like it) and you can support our work with a donation. As we are a government regulated harm prevention charity, in Australia donations of $2 or more to support our work are tax deductible.